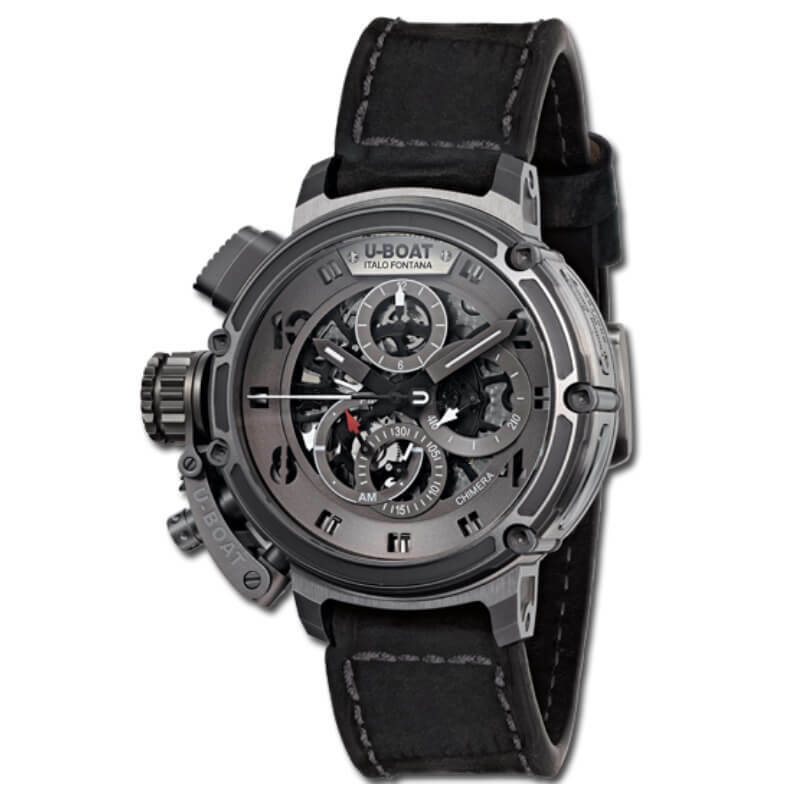 Special Squelette automatic chronograph, modified to U-BOAT specifications. Personalized silver 925 rotor consisting of a base and three bridges fixed with blue screws. Hours, minutes, seconds, chronograph, 24h indicator. Grade 5 titanium case, 46 mm diameter. Distinctive crown on left side with patented protection device. The bezel and case back are locked together by external tubing and a customised key that ensures total waterproofing. Oversized crown cap for easy handling, in a protected position at 9 o’clock. Chrono pusher with milling on the external surface. A small window on the side reveals the movement inside. Laser cut hour and minute hands. Hands treated with white superluminova. Hand of the 24h indicator in red colour. Curved sapphire glass on the face, anti reflective treatment and flat on the back of the timepiece. Hand made and hand finished alligator leather, hypoallergenic and color retain treatment. Titanium tongue buckle. Width: 20/22 mm.